We invite you to explore India - the Land with infinite beauty ! Whether you soar high into Himalayas or peer under the ruins of the Ancient monuments dotting the landscape of India, you will cherish the experience long after your visit ! This India Travel Guide on Rock Shelters of Bhimbetka is free from any commercial interest! This site is dedicated to promote India - the vast subcontinent, its glorious past, magnificent landscape and its infinite variety. The Rock Shelters of Bhimbetka are natural rock shelters that house rock paintings from the Paleolithic and Mesolithic periods through the Chalcolithic to the mediaeval periods. The Rock Shelters of Bhimbetka are located in the foothills of the Vindhyan Mountains. These shelters reveal the earliest traces of human life in India and these rock paintings are listed among the worlds oldest. These shelters offer a virtual pre-historic view of India. The paintings are spread over five clusters of natural rocks and these paintings speak volumes about the traditions and culture of people living in adjacent villages. The paintings on the rock are mostly in red, white, green and yellow and reflect the lives of the hunting and the gathering communityThe lives of the local adivasis can be clearly understood from the rock painting depictions. V.S.Wakankar discovered this site in the year 1957 and from then on has carried out extensive study on the paintings and the rock clusters. The Bhimbetka rock shelters are covered by huge sculpted sandstone rock formations that are clustered around the Bhimbetka Hill. The rock shelters display important traditions of rock painting dating back from the Mesolithic to the Historic period. These rocks also display a plethora of wall paintings that are understood to be one among the densest collections of rock art. These exceptional paintings can be found even on the ceilings of the rock shelters, the ceilings extending to scary heights. Studies reveal that these rock shelters were occupied by man 100,000 years back. A few paintings date back to about 30,000 years. Bhimbetka is associated with Bhima of Mahabharata, the word means 'sitting place of Bhima'. The Rock Shelters of Bhimbetka depict the lives of the people who lived in the caves. The paintings on the rocks include scenes of childbirth, communal dancing, drinking, and religious rites and burials, horse and elephant riders, animal fighting, honey collection, as well as the natural environment around them. Many of the rock shelters are located within fairly dense forest that includes a high diversity of flora and fauna. These flora and fauna are being utilized by the locals. The Rock shelters of Bhimbetka have an interesting artistic quality that has been derived from the beauty of the naturally sculpted rock formations. The complementary lush and densely wooded vegetation add to the overall artistry. The Rock Shelters of Bhimbetka showcase the manner in which our ancestors lived. 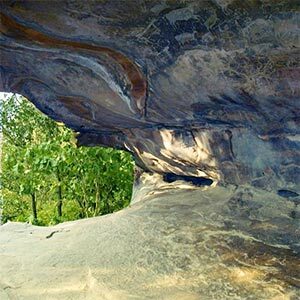 While living in these rock overhangs, they definitely would have been threatened by the calamities of nature, wild animals, forest fires, etc. Erosion over the years has paved the path to few unique rock formations resembling split-level shelters. It is believed that these unusual split level shelters were used as the king's palace while the corridor-like high-roofed caves were used as the king's court. Upper Paleolithic: dark red and green pictures of animals like bison, rhinoceros, etc. Mesolithic: pictures of animals, human figures, weapons, etc. Chalcolithic: pictures of agricultural goods, etc. Early historic: red, white and yellow paintings depicting people, religious belief, etc. Medieval: geometric, linear pictures, paintings became more schematic. Depending on the type of tools used in rock paintings, the rock shelters of Bhimbetka display the chronological evolution of prehistoric man. The natural red and white pigments in the paints have helped in retaining the glory of the paintings over centuries. Brushes were made of fibrous plants. Don't miss the 'Zoo Rock' which has depictions of bison, deer, sambar and elephants. You can find paintings of peacocks, snakes, deer and hunting scenes. . Manganese, soft red stone, wooden charcoal, etc have been used to make colors. Studies indicate that animals fat and leaf extracts were also used in making the mixture for painting. Many paintings are seen super-imposed over older ones. Only a small part of the site is open to visitors. A pathway with signposts leads the visitors to about 15 rock shelters with paintings. Bhimbetka is a great source of joy for art lovers. There are government approved guides to take visitors around the place; people who wish to explore the place by themselves can also do so. Bhimbetka is located in the Raisen district of Madhya Pradesh. The Rock Shelters of Bhimbetka can be reached from Bhopal by road. Visitors can stay at Bhopal as there are not many convenient accommodations here.